Otto's has a unique collection of specialized implements: Wooden Hungarian squash graters which shred squash for a veal dish called "tökfözelec;" numerous spaetzle makers; pastry boards, hard-to-find poppy seed grinders for pastries and delicious pasta dishes; special pans for making "palacsinta" (Hungarian crêpes); "potato ricers" for making dumplings; and all sorts of meat, nut, and sausage grinders. Chestnut Puree Press "Gesztenyepüré nyomo"
There is no substitution for FRESH POPPY SEED!!!! How can one make it without this ideal kitchen mate and still win prizes for the best strudel or beigli on the city? You may grind fresh poppy seed to create a perfect consistency. 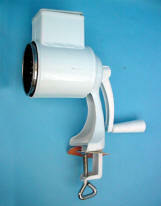 The grinders comes with an easy to grip handle and sturdy clamp. "Grind right before you are ready to bake!" This durable grinder can grind other seeds: poppy seed, peppercorns, spices, coffee, flax, and some nuts. Made of heavy tin coated cast iron. Designed in the Czech republic. The "all metal" grinder is very durable! Grinder is 9 in. tall. 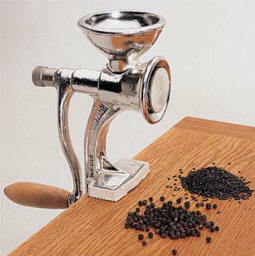 Poppy Seed Grinders are non-returnable. How can one make it without this ideal kitchen mate and still win prizes for the best strudel or beigli on the block? 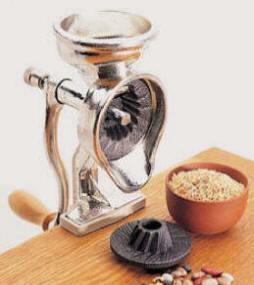 Produce flour from grain or grind all types of spices, seeds, coffee or nuts. Two sets of identical 3" diameter grinder plates are natural cast iron, machined and sharpened. For coffee bean grinding an extra pair of grinding stones is provided (Shown). This durable mill can grind other seeds: peppercorns, spices, seeds, coffee and some nuts. Made of heavy tin coated cast iron in Czech republic. Disassembles for easy cleaning after use. Mill is 11 in. tall. Imported Hungarian style spaetzle machine and spetzle maker. Makes the perfect Spaetzle "Nokedli".... STAINLESS STEEL. For use in the home or professionals. Turn crank and watch dumplings plop in. This model has easy to use pot clamps. Great for delicate, teardrop-shaped Hungarian or German egg dumplings. 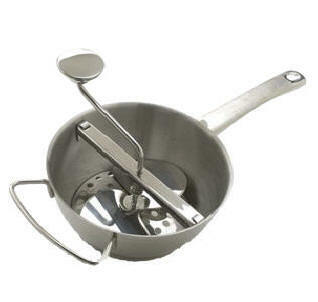 This deluxe top-of-the-line rotary spaetzle maker is made of stainless steel. It has just the right sized holes to give you the perfect size tiny dumplings every time! Simply add the dough and crank the handle for efficient results. Features durable construction with a sturdy long handle on one side and looped handle opposite for easy maneuvering when full. Measures 8.5-in. across. Serve your spaetzle as a side dish or in soups, and make it extra appetizing by adding fresh herbs. EASY TO CLEAN... just drop into the dishwasher. Perfect for Hungarian Chicken Paprikas, Porkolt, Nokedli, Spaetzle, and other great meals and recipes. Comes with three different screens... great for mashing and tomato puree too!!!! SLIDING - SPAETZLE MAKER - "Nokedli Szagato"
Imported Viennese style Spaetzle machine. You just fill the cup with dough and hold over pot of boiling water. Slide cup back and forth over the openings and the little dumplings just drop in. NOTE: Spaetzle maker is slightly different than the one pictured. Filler is square instead of round and the handle is flat. Grind your own meats and know exactly what goes into the meat you feed your friends and family! 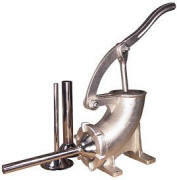 Great for making sausages, meat loaf or your own ground beef! Chop up leftovers. Includes high quality knife, handle, and plate. Please specify size of grinders. 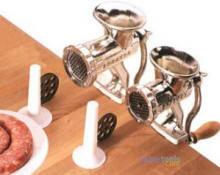 Sausage Maker - A great gift! • Patent Pending tube attachment. • Easy to use and clean. Accepts #22 bell-shaped tubes. • Compacts for easy storage. • Comes with a set of three plastic stuffing tubes. • Stuff sausage sticks to bologna and salami. • Feet are grooved for optional jerky attachment. 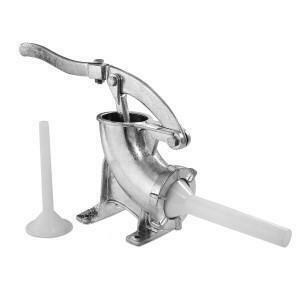 High Quality Stainless Steel 5 Pound Sausage Maker with 5" diameter throat. Made with heavy-duty stainless steel. 10 mm Funnel for snack sticks and small sausages. 20 mm Funnel for pepperonis, bratwurst, etc. 30 mm Funnel for summer sausages, salamis, and luncheon meats. Easy to mounts on a counter or table top. Includes rubber gaskets to prevent meat from leaking around the plunger and front ring nut. Ergonomic Handle for greater leverage and easy stuffing. Easily disassembles for easy clean-up. Great for domestic and wild game too! High Quality Cast Iron 5 Pound Sausage Maker with 5" diameter throat. 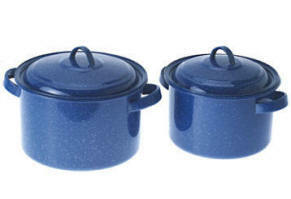 Made with heavy-duty food-safe coated cast iron. 10 mm Stainless Steal Funnel for snack sticks and small sausages. High Quality Cast Iron 3 Pound Sausage Maker with 5" diameter throat. The secret of success! This handy tool makes Chestnut Puree light and fluffy. Easy to operate! Many more uses. A "something different" gift. Produce fluffy, lump-free mashed potatoes or chestnut puree with minimal effort using this classic tool. This vintage-style ricer uses state-of-the-art design to make your potatoes or chestnut puree to your preferred texture. Crafted of durable stainless steel and coated aluminum, it’s angled to provide extra leverage. Just give the handles a squeeze and the tool quickly presses cooked potatoes, tomatoes or fruits through the perforated hopper. Triple-plated chrome and enamel finish: 11-in length, 3 1/2-in. cup diameter. The secret of success! Easy to operate! Many more uses. This sturdy potato masher and tomato press is super helpful for those in the kitchen who wish to creat great meals. Try it for mashed potatoes, soups, "gnocchi," "passatelli," or on the occasion "ice spaghetti." This polished sturdy aluminum has interchangeable disk, and is designed to remain safe and easy to clean. The unit has a triple-plated chrome finish: 11-in length, 3 1/2-in. cup diameter. The THREE in ONE GRINDER! Parts can easily be removed and cleaned. Suction clamp ensures stability. Perfect for the occasional use for baking or in the kitchen. Come with three different amazing graters for the mill. Most graters and mills come with a 2 year manufacturer warranty. Regular $ 35.95 SALE $ 29.50 ea. for bread crumbs, or overall grinding. Dió, különféle kemény magok, sajtok, száraz kenyér és kalács ő rlésére. This grinder and casing is metal and not plastic. Most other grinders are made of plastic and cheap materials. This is a high quality grinder. This metal grinder is perfect for home and very easy to clean. * Made of high quality metals with a stainless steel drum. Internet Special... Buy 2 and save $5 off your product total! "Tök Gyalu" Great for Stuffed Cabbage for slicing too! Adjustable 3¾" blade with beautiful natural plantain wood. Fast and easy way to make Homemade coleslaw too! Super sharp blade. For 1mm strips and up! Easy to clean. Up to 3 Kilograms · Large Reversible Scoop - easy storage. Large Stainless Steel Blade · Easy to clean. METRIC KITCHEN SLIDING BALANCE SCALE "KONYHAMÉRLEG"
Great for accurate cooking. Helps with your European receipes. Perfect to the GRAM!!!! 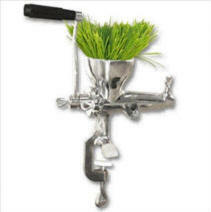 STAINLESS STEEL JUICER / "WHEAT GRASS JUICER"
Superb juice extraction for wheatgrass, soft fruits, and vegetables. Clamp on style easily attaches to any countertop up to 1½ inch thick. Fully disassembles for quick & easy clean-up. Damage preventing rubber pads protect delicate work surfaces. The Wheat Grass Juicer offers superb juice extraction for wheat grass, soft fruits and soft vegetables. Ergonomically designed crank handle turns effortlessl. The clamp on style easily attaches to any countertop up to 1½ inch thick. Reg. $99.95 Internet Sale $69.95 ea. Generations of cooks have prepared pastry and dough on traditional cleat-ended boards. Ideal for rolling large amounts of pastry, pasta, or kneading dough for a pizza or as a langos base. Great for stuffed cabbage, goulash, Hungarian soups! Buy 5 and get one FREE! Great for creating Gift Baskets too! With Removable Side and Bottom · "TORTA SÜTÖ"
Round baking and cake pan. Great for homemade cakes and products. For easy cake removal. A must have gift for any kitchen. Tinplate features the high-quality tinned steel preferred by traditional bakers for its performance. The smooth tinned surface creates a stick-resistant surface. The combination of the steel gauge and the silver color allow the pan to absorb the proper amount of heat to produce a perfectly brown crumb and a moist, tender inside pastries. BAKING PAN · "U" Shaped "ÖZGERINC SÜTÖ"
Several sizes and styles available. Stands are separate. Imported from Hungary. Copper, Porcelain, Stainless Steel, and many other. Made from hot-rolled half-inch bar stock. 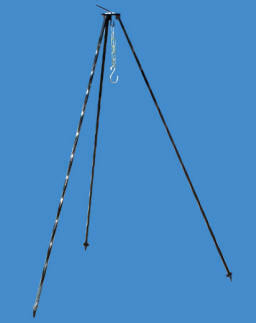 These tripods are ideal for hanging a gulyas kettle, Dutch oven or camp oven. The Tripod has 43-1/2" legs with chain. (Over three feet tall) Durable and great for the outdoors. Great for serving goulash or as a decoration. 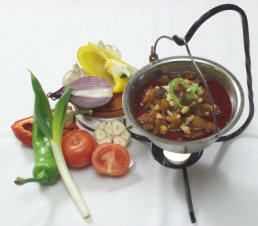 This is the ultimate way to serve up a goulash on your table. Includes mini-kettle, holder and stand. Makes a great gift!. Add an small "tea candle" to keep items warm. Perfect for a fine meal. 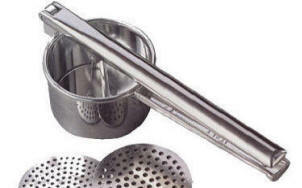 Great for making pastry, makos or dios beigli, cookies, pie crusts, etc. A must have for any kitchen! Made of a hard wood. Provides plenty of room for using rolling pins, cookie cutting, and placing flour. Each board is hand made of real natural wood. 2320 West Clark Avenue, Burbank, California 91506 U.S.A. Copyright © 1995 - 2018 * All rights reserved.